The Ultra high output dispensing pumps are built tough to be able to dispense up to 30 cc (1 oz) per stroke of products as thin as water or as thick as heavy creams. It is comfortable for consumers to use for products such as ketchup and mustard in the food service industry, yet able to withstand chemicals such as industrial cleaners for the janitorial industry. 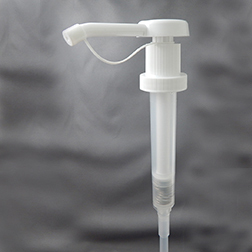 The Ultra high output dispensing pumps are made to fit in the least amount of space, and to fit the greatest variety of bottles, jars, and jugs. Even though these pumps feature the most comfortable ergonomic head and mechanism made, they are built to last. We will sell you as little as 1 case of these dispensing pumps, which is perfect for small manufacturers or home based businesses filling a small run of bottles or jars from larger containers or drums. Since the pumps can be disassembled and reassembled by hand, they are safe and easy to clean. With more than a dozen stock caps sizes available and our ability to manufacture custom cap and dip tube sizes in-house, we can offer you pumps than can fit more containers than anyone else in the industry with the smallest minimums and shortest lead times as well. Lightest stroke – Easiest to prime, easy to use with the least fatigue of any high output pumps. Most Ergonomic Head – Unsurpassed comfort for your customer, they use more product so they reorder more often! Longest Spout – Has the greatest reach for ease of use perfect for counter use in the food and beverage industry. Shortest Tank – Fits more containers than any other pump. Shortest Stack Height – Takes up less space and fits in tighter cabinets and shelves. Can be used either with or without springs for the greatest flexibility. All pumps can be disassembled by hand so that they can be cleaned and reused. Perfect for the food industry. A high viscosity model as well as one that pumps extra large particulates are available. Drum and Pail pumps from 2 oz. to 10 oz. also available.